Trump and Macron planted a tree — but where did it go? 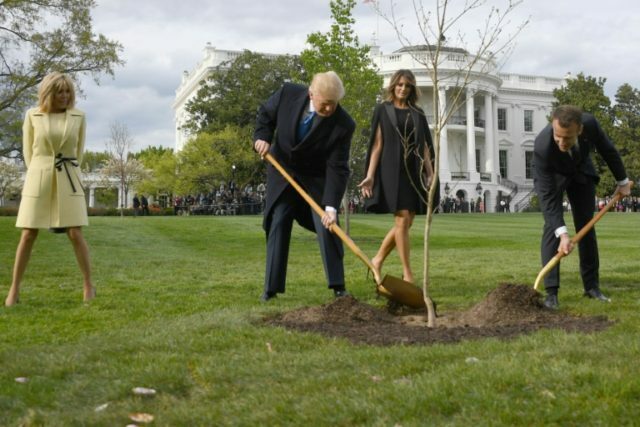 Washington (AFP) – The photograph was seen around the world: US President Donald Trump and France’s Emmanuel Macron, gilded spades in hand, shovelling dirt over a young sapling. It was a symbolic gesture: the tree came from a northern French forest where 2,000 US Marines died during the First World War. But a few days later, the plant was nowhere to be seen. “It is a quarantine which is mandatory for any living organism imported into the US,” Gerard Araud, French ambassador to America, wrote on Twitter. When a follower fired back that the caution seemed a bit late — given that the tree had already been planted — the diplomat went on to confirm that the roots had been enclosed in plastic.